Digital signage is playing a major role in a new global marketing campaign by cosmetic company Revlon, with REVLON LOVE IS ON marking a re-launch of the brand and its first global tag line in over a decade. More than a marketing campaign, the Revlon brand is dedicating itself to inspiring love and connecting with people around the world on an emotional level. This brand cause will be seeded through all channels and across all markets. “The idea for LOVE IS ON grew from our quest to find a universally inspiring emotion,” says Lorenzo Delpani, Revlon president and CEO. “Love is by far the most powerful and most positive. It is very important for us to evoke positivity with our new brand cause. “Through the course of our journey to LOVE IS ON, perhaps serendipitously, we found love in Revlon. Truly, L-O-V-E is at the heart of the word REVLON. And O-N is at the end of REVLON. When you are ‘on’ you are open to all the emotions of love from attraction and adoration to seduction and passion. LOVE IS ON is incorporated into every facet of the marketing strategy across all global markets. The re-launch comes to life through a brand manifesto television and digital ad set to a new recording of the classic song, ‘Addicted to Love’. The manifesto is an inspirational love story showing the evolution of love from flirtation to infatuation to passion. In line with the new positioning, TV, print and digital advertising will feature brand ambassadors Halle Berry, Emma Stone and Olivia Wilde. 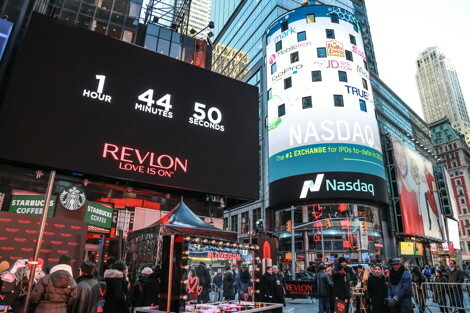 In addition, Revlon this week introduced the Global Love Beacon, an interactive Clear Channel Outdoor billboard in New York City’s Times Square that allows people to share love from around the world, to the world, 24-7. Located above the Broadway Pedestrian Plaza at 1500 Broadway at the corner of 43rd Street, the Global Love Beacon features a LOVE IS ON Live camera, that captures and streams user generated ‘love moments’ onsite. People from around the world are invited to join the conversation for a chance to have their photo or message featured on the Global Love Beacon billboard by showing their love via social media using the hashtag #LOVEISON. 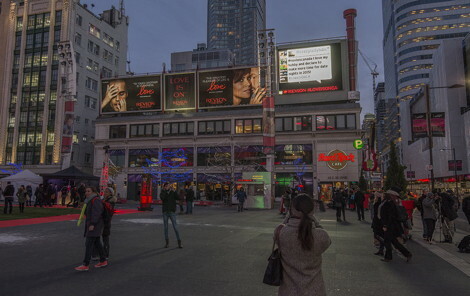 In Canada, Toronto’s Dundas Square, Cieslok Media boards are running Revlon’s Love campaign, again involving social media. We believe that LOVE IS ON is also the feature on digital boards in London and other worldwide cities, but have been unable to get that confirmed. This entry was posted on Monday, December 1st, 2014 at 05:00 @250 and is filed under DailyDOOH Update. You can follow any responses to this entry through the RSS 2.0 feed. You can leave a response, or trackback from your own site.